For the implementation of the respective demonstrations, parties from the telecommunication and the automotive industry are involved, as well as academia and Small and Medium-sized Enterprises (SMEs), covering a diverse set of demonstrated aspects. Towards the end of the project, these demonstrations will be shown on the UTAC-CEVA test track in Montlhéry, France, as part of a larger event. More details on the demonstration activities in 5GCAR are summarized in Deliverable D5.1. 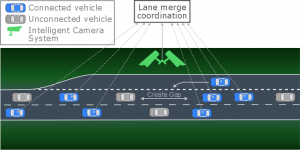 The lane merge coordination demonstration shows a cooperative maneuver for optimizing the process of entering a motorway, for a mixture of vehicles that can and cannot communicate. This is enabled by having a camera system with object recognition capabilities monitoring the lane merge area. Furthermore, the vehicles send information about themselves to a central coordination entity, which first combines this information with the camera output, and then devises a maneuver in real time. Corresponding driving instructions are subsequently communicated to the affected vehicles, next to background traffic such as entertainment video streaming. The coexistence of these two data traffic types is enabled using Network Slicing and Quality of Service, combined with a distributed cloud deployment and a messaging hub for efficient communication over the cellular network. While the use case itself targets autonomously driving vehicles, and the communication KPIs are formulated accordingly, the demonstration will be presented using human drivers. A human-machine-interface will be used for giving driving instructions to the respective driver. 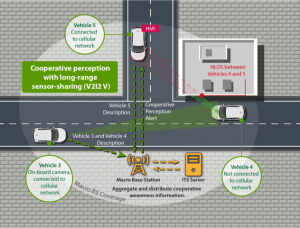 The cooperative perception demonstration shows the benefit of vehicle-to-infrastructure and vehicle-to-vehicle communication for enabling, respectively, long-range and short-range sensor sharing between vehicles for safer and more efficient maneuvers. 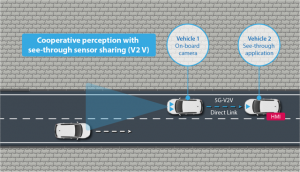 The short-range sensor sharing scenario is enabled by a “see-through” application which uses low-latency video streaming from an on-board camera of a vehicle to allow a rear vehicle to see through it, thereby enabling a safer or more efficient overtaking maneuver. The low-latency video streaming is realized by highly reliable and low latency direct communication between the two vehicles. 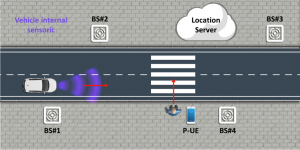 The long-range sensor sharing is enabled by an on-board camera and sensor-fusion system that detects all, connected as well as unconnected, vehicles in the vicinity and shares this information over the cellular network to nearby vehicles. Thus, the perception of the latter is extended resulting in more informed maneuver decisions, particularly while navigating blind intersections. The vulnerable road user protection demonstration aims at extending today’s vehicle-internal VRU protection systems, which are limited in challenging scenarios such as dense urban settings with non-line of sight between vehicle and VRU, which is a limitation of vehicles’ on-board sensors. To address this, a network-based positioning and collision prediction system is established. The targeted scenario is a crosswalk over an urban road, where a pedestrian is walking toward to zebra-crossing from one side of the street, and the vehicle approaches the zebra-crossing, although many other scenarios are possible and under discussion before the final demonstration. The vehicle and the pedestrian send proprietary broadband 5G uplink reference signals to several base stations, and each base station then measures the time of arrival of the signals to allow triangulation of the vehicle and pedestrian positions. Additionally, the vehicle and the pedestrian provide sensor data, such as GPS measurements, speed, yaw rate, and orientation. All this information is fused in a network element which estimates the trajectories of the users based on a motion model and a map. Finally, an alert message is triggered if a potentially critical situation is detected, and a corresponding warning is transmitted from the network to the vehicle and the pedestrian. A special human machine interface in the vehicle and communication device at the pedestrian makes them aware about the upcoming dangerous situation. All tests are executed off public roads, where privacy laws are respected, and the safety of all participants is ensured. The pedestrian VRU in the demo specifically will be a dummy.